Welcome to Down On The Street, where we admire old vehicles parked on the streets of the Island That Rust Forgot: Alameda, California. 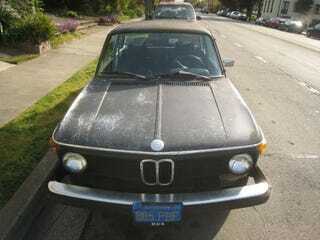 I've been passing this car by for a few months, because I mistook it for this 2002Tii. It lives in the same neighborhood as the Tii and the color looks the same… but then I realized that today's car has the newer 2002's taillight design. It's a different car! Here comes the camera! We've seen plenty of Alameda 2002s in this series; in fact, today's car is our ninth, after this hot-rodded '71, this pretty nice '72, this total beater '72, this '73 2002tii, this automatic-equipped '75, this work-in-progress '75, this grille-challenged '76, and this daily-driven '76. Sharp-eyed readers might note that this car is parked in the same spot in which we saw the 1980 Datsun 280ZX a while back; I suspect that we're looking at an ex-Datsun owner's latest Hell Project.